Prompted by suggestions from the German Aerospace Center (DLR), researchers at Septentrio have investigated and reported on what they describe as anomalies in the signal from the Compass (Beidou-2) M1 satellite, launched April 14, 2007. 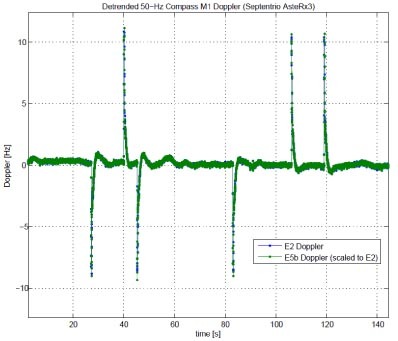 According to Jean-Marie Sleewaegen, a systems architect at the Belgian GNSS manufacturer, analysis of high rate Doppler data from the Compass M1 E2 and E5b carriers reveals frequent spikes in frequency. This is shown in the accompanying figure that shows the M1 Doppler for a period of about 2.5 minutes arbitrarily selected from a pass of the satellite over Leuven, Belgium. The Doppler data in this plot have first been detrended to remove the effect of the satellite motion. Unexpected frequency glitches are clearly visible as three positive and three negative spikes. Sleewaegen believes the anomaly clearly indicates a problem onboard the satellite, possibly due to malfunction of the frequency reference of the signal generation unit. The phenomena occur about two to three times per minute at seemingly random intervals, he said. The Compass M1 data used in this analysis have been obtained with the Septentrio AsteRx3 receiver. Septentrio thanked Oliver Montenbruck of DLR for stimulating discussions, which motivated the company to begin the research.